In the distant future, five nation-states vie for control of a feuding universe that is cast deep into the stars and far from the origins of the original habitat, Earth. What was once a system sought after for its rich, plentiful resources, EVE has now become a breeding ground for political conflict and industrial warfare. 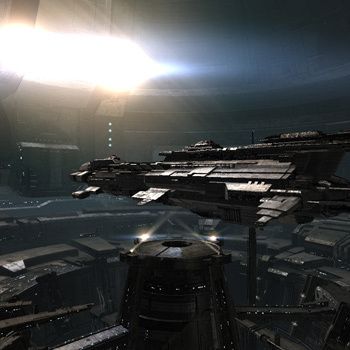 As a pilot within the EVE universe, you’ll immediately be trained in warfare, industry and science. Once proficient, you’ll be set loose on the universe, where the only thing stopping you is your own imagination. After some time and once your skills have increased and your arsenal improved, you may decide to become the leader of your own corporation, explore the far reaches of space, seize your own solar system or become a pirate, always testing your fate amongst your enemies and the stars. Whichever path you choose, there is nothing that can prepare you for some of the most intense heart-stirring battles this side of Heimatar.